I have never been good in this field that is, looking for a good tutor for my kids. Actually I am not even sure how you classified good tutors? Grade producer or motivation encourager? For my son's primary education, I went through two Chinese tutors for him before I decided to give up Chinese. Both just couldn't handle my son and both walked out on us on the eve of a test. Then came Prelim and I was worried when I saw the result. Got another that charged me S$100 per hour and while he was here, he will be texting away or having toilet break (big business) while my son is doing assessment. I tolerated for a few lesson and in the end I told him that I am expecting him to help my son to attain As. I fired him after when he said it takes two hands to clap? If you didn't even put in effort to see whether you can motivate my son further how do you know that my child will not respond? Then I had another that is constantly on medical leave. So in the end, I should say that my son's PSLE result was 100% son's effort. He could have done better as all the teachers' expected but we have no complains about his aggregate. He did get into the school of our choice. 5 years down the road, for my little one, we had no choice as she was falling behind all her peers and her started feeling insecure. I even got the school special need teacher to examine her but the result was negative. Some how some where, she just couldn't comprehend the syllabus being taught in school. I blame the inefficient teachers thus I had to outsource as the syllabus is way past what I know during son's time. It is not that I cannot derive the answers but the method in approaching how it is being solved is different. Anyway, I am glad that I found a Chinese tutor that can motivate my girl and now she is enjoying this subject that was her weakest. Her English also seems to be slight improvement but unfortunately the class size is so big that the tutor has problem focusing on individual. So I am really not too sure whether I need to seek out another. As for her Math and Science tutor, this one is totally out. If you are telling me that my girl lacks the foundation or basic, then why are you still pushing her to do past year papers and not helping her to comprehend those topics that you said she lacks? Now I am on the path once again, seeking help from experienced mom that knows actually what is good and bad tutors. Let's hope the Ministry will do something about tutors who obviously are out to earn big money and trying to help a child to gain knowledge. Enough of this housewife's ranting, see what I baked today .... a Cinnamon Apple Walnut Torte. A mouthful isn't it? Initially I had no plan to join this round of Aspiring Baker as I was busy with my project. Let's have some story time. I bought 5 Granny Smith apples with the intension of making apple pie. The day I wanted to bake it, I found only two remaining so there goes my plan. I saw THB is hosting this recipe from Coffee Cakes by Lou Seibert Pappas, and it fitted perfectly to my two green apples! yea no wastage! I have eaten chocolate torte but not one with fruit base. It tasted like a pudding without sauce. Thus I made some caramel sauce and as girl requested for vanilla ice cream last week, I had some still in the freezer. So this is how I pair it off. Will I make this again? ehhh... I doubt so. Preheat the oven to 170 deg. Greased and lined baking pan. Beat eggs until frothy and beat in brown sugar and vanilla until light. In another bowl, stir the flour, salt and 1/2 tsp cinnamon to blend. Stir the flour mixture into the egg mixture. Reserve a handful of walnuts for the topping. Mix the remaining nuts, apples and cranberries into the batter, spread into the prepared pan. Bake for 25 mins or until the cake is set and golden brown. Let cool slightly and serve warm. Heat pan and add in 4 tbsp sugar. Melt till it become golden. Add in a tbsp of butter and stir till it melts. Set a strainer over the top of the smaller bowl and pour the cream into the bowl. Awww Edith, I hope you manage to solve the tutor problem. It is tough, that's for sure. Your torte looks delicious even if you didn't think it tasted it. Yah I seriously hope so coz it is so near to girl's exam. haiz. Alice, I felt this torte tasted better with another compliment like ice cream. It is quite hard to find a tutor that isn't just in it for the money. They need to be genuinely interested in helping your child and improving their results...I hope you manage to find one that is capable and trustworthy! Have a great weekend! I finally found a Math tutor who seems to be THE ONE. Let's pray that it will work out and let my gal gained some confidence in this subject. Thank God my ordeal is over! My son is in his 1st Poly year; we were all delighted that he got into his top choice. No more tuition. Lol! I sympathise with u. Hope everything gets better for u. Love everything about this dessert, except that I'll do away with the cinnamon.... it's too strong for me. I like the pairing with ice-cream as well. I'll be throwing another Giveaway very soon, this time just for S'poreans for watch out for it! Shirley no kidding, your son is already a big boy! Wow you looks really well maintained. Hahaha! Thks, dear! Children grow so fast! hi edith, tutors must treat all their students like their own kids then i think their dedication will be there. Not just i teach , you listen..i think communication both ways are just as equally important..i think a good tutor will know what approach to take to help the kid. 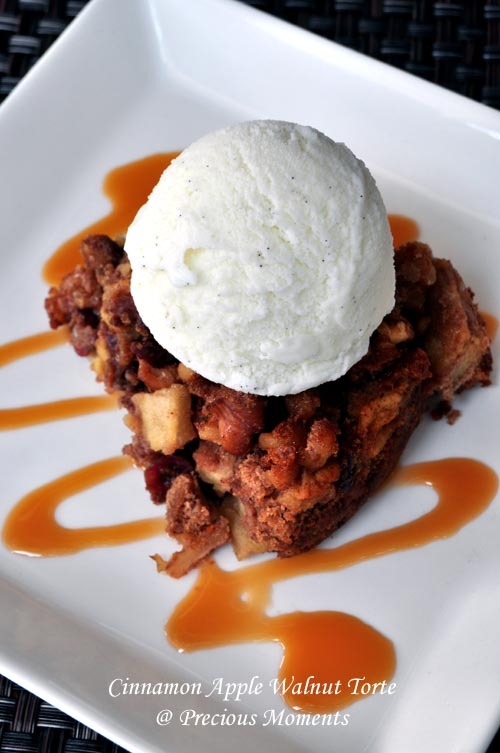 I quite like this apple dessert, i couldnt agree more that it's is more delicious to be eaten with ice cream! Poor Edith, sounds like you have been going through such a hard time these days. Your boy, your maid & your computer!!! Just take it easy & stopped pulling your own hair. You will get old very fast. haha.... Oh, I'm not blaughing. There always a way to sort things out, so no need to put yourself in such headache situation. You'll find a better way when your mind is calm & clear. Take a break take a KIT KAT.lol. :o) Probably, ice cream will help as well.